I found many ways to implement a backdoor, some are Nobody-But-Us (NOBUS) backdoors, while some are not (I also give some numbers of "security" for the NOBUS ones in the paper). Here the modulus \(p\) is prime, so we can naturally compute the number of public keys (elements) in our group: \(p-1\). By factoring this number you can also get the possible subgroups. If you have enough small subgroups \(p_i\) then you can use the Chinese Remainder Theorem to stitch together the many partial private keys you found into the real private key. The problem here is that, if you can do Pohlig-Hellman, it means that the subgroups \(p_i\) are small enough for anyone to find them by factoring \(p-1\). The next idea is to hide these small subgroups so that only us can use this Pohlig-Hellman attack. Here the prime \(n\) is not so much a prime anymore. We instead use a RSA modulus \(n = p \times q\). Since \(n\) is not a prime anymore, to compute the number of possible public keys in our new DH group, we need to compute \((p-1)(q-1)\) (the number of elements co-prime to \(n\)). This is a bit tricky and only us, with the knowledge of \(p\) and \(q\) should be able to compute that. This way, under the assumptions of RSA, we know that no-one will be able to factor the number of elements (\((p-1)(q-1)\)) to find out what subgroups there are. And now our small subgroups are well hidden for us, and only us, to perform Pohlig-Hellman. My understanding of this paragraph is that setting p_big, q_big to 100 bits primes to defense Pollard's p - 1 Algorithm, and using Pollard's Rho Algorithm gives us about 2^51 computations which is agreeable. But 2^51 = 10^16 computations are kind of large, aren't it? I only know that my computer can run about 10^8 computations a second. 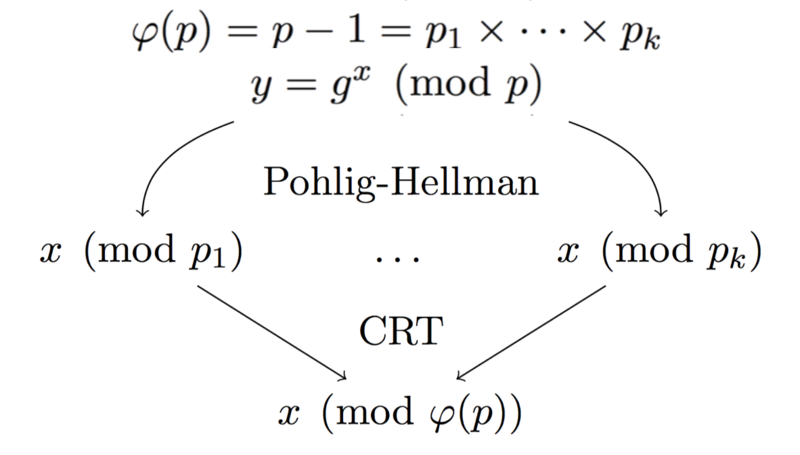 Because Pollard's p - 1 has complexity roughly O(B), and Pohlig Hellman has complexity O(sqrt(B)), which is much faster. When the number is big, Pollard's p - 1 is hard to do but do-able, and Pohlig Hellman is a piece of cake. When the number is huge, Pohlig Hellman is hard to do but do-able, and Pollard's p - 1 will be impossible.